SFT has launched its new website. With this new website, our clients can clearly know more about who we are, what we do and how we do. 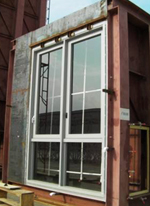 Sanxin Facade Technology Ltd. has exhibited at this international windows, doors & fenestration show as an innovative exhibitor. This is SFT’s second year participating in this international fenestration show. To expand its business, SFT has added a fully equipped production line in 2011. With 6 production lines in total, SFT has expanded its production capacity to more than 300,000 square meters per shift and has successfully secured several prestigious projects in Australia and Hong Kong this year. Sanxin Facade Technology Ltd. has exhibited at this international trade fair for Window, Door and Facade Technologies, Components, Pre-fabricated Units. 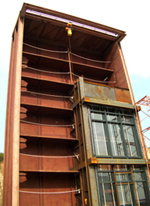 With these testing chambers, SFT can do air infiltration test, water penetration test and wind load resistance test for curtain wall and win-doors in accordance with international standards.